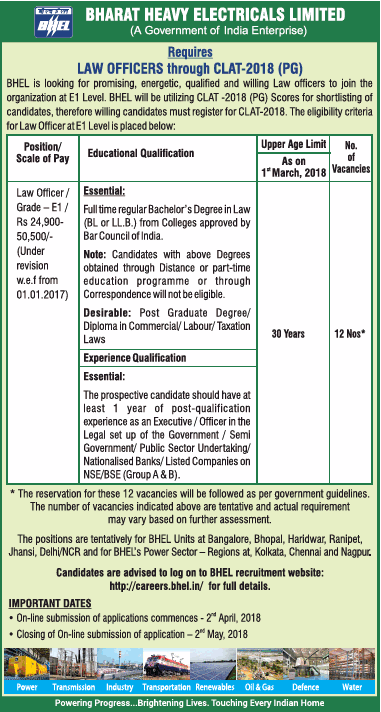 Bharat Heavy Electricals Limited (BHEL) is looking for Law Officers to join the organisation at E1 level. BHEL will be utilising CLAT 2018-PG Scores for shortlisting of candidates, therefore willing candidates must register for CLAT 2018 for which the last date is March 31. Click here for information on CLAT application. Education: Full time regular Bachelor’s degree in Law (BL or LLB) from colleges approved by Bar Council of India. Note: Candidates with above degree through Distance or part-time mode will not be eligible. Desirable: Post Graduate Degree/Diploma in Commercial/Labour/Taxation Laws. Experience: Prospective candidates should have at least 1 year of post-qualification experience as an Executive/Officer in the legal set up of the Government/Semi-Government/Public Sector undertaking/Nationalised Banks/Listed Companies on NSE/BSE (group A&B). Closing of online submission of applications: May 2, 2018. Application link will be available on this page from April 2.